Frage: Was ist Raka? Antwort: Ein grobes Wort, den nächsten Angehörigen gegenüber als leiser Tadel gebraucht. This is a question-and-answer kind of commentary note on the word raka in Mt 5:22. There is probably something analogous in Greek or other scholia, but I have not checked. For this word in Syriac and Jewish Aramaic dialects, see Payne Smith 3973-3974; Brockelmann, LS 1488; DJPA 529b; and for JBA rēqā, DJBA 1078a (only one place cited, no quotation given). For the native lexica, see Bar Bahlul 1915 and the quotations given in Payne Smith. So now we return to the scholion given above. Question: What is raka? Answer: An impolite word found [when one wants] to berate one’s neighbor in a slightly gentle way. That is, according to the scholiast there are harsher, stronger vocatives with which to berate someone, but when just a little verbal aggression is needed, raka is the word to choose! In a previous post I highlighted the writing of someone’s name upside down to curse their memory. Another way is the deliberate alteration of someone’s name. 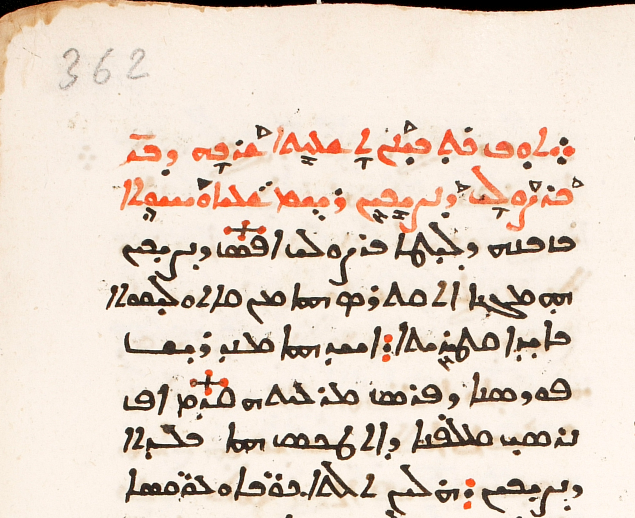 Here is an example from CFMM 256: a short piece on Barṣawmā, bishop of Nisibis, (not to be confused with the roughly contemporaneous Syriac Orthodox monk Barṣawmā, whose many miracles are delineated in a lengthy text at the end of this very manuscript; see here). In the manuscript, this work logically follows the preceding one, which is on Nestorios. This is not the first time the distortion of Barṣawmā’s name has been noted. Stephen Gero collects the known evidence in his Barṣawma of Nisibis and Persian Christianity in the Fifth Century, CSCO 426 (Louvain, 1981), 25-26 n. 4. One distortion that occurs in west Syriac manuscripts is BarṢWL’ (= -ṣulā, -ṣulē, -ṣawlā, -ṣawlē? ), which Gero cites from Bar ˤEbrāyā’s Chronicon Ecclesiasticum. He points out, though, that this word form (he does not posit either of the two forms with the diphthong, which is how the example above is vocalized) makes little sense as it is, since it does not mean anything in Syriac. He offers as its origin the word ṣulāyā, which he claims means”perversion (of justice)”, a meaning apparently taken from the English Payne Smith (p. 475), but notably, the big Payne Smith (col. 3401) calls this word, for which only two occurrences seem to be known, a “vox incerta”! The appeal to Arabic ṣawla, which in any case does not always have negative connotations, does not strike me as well-founded. Could it be that the purposefully distorted name is simply that, a distorted form without actual semantic weight on its own? That is, the last syllable has been changed from -mā to -lā, -li, or -le, and we should give up looking for some proper meaning in a word with the consonants ṢWLY (as in this manuscript) or ṢWL’ (as in the passage from the Chronicon Ecclesiasticum)? Is it also not without significance that the handwritten combination of the Syriac letters WL, if the L is slightly short, is very close in appearance to M, which is the correct letter in the regular form of Barṣawmā’s name? Il s’agit, à notre sens, d’une calligraphie spéciale du nom de Barsauma, que les Jacobites avaient l’habitude d’employer pour marquer leur mépris ou leur désapprobation envers lui. On sait qu’ils conservent jusqu’à nos jours l’habitude d’écrire le nom de Satan à l’envers. D’ailleurs cette façon d’écrire le nom du Barsauma nestorien leur permettait de le distinguer de leur Saint Barsauma. Vööbus once referred offhand in a list of “vitae which no scholar has seen” to a “Bar Sūlā of Nisibis”. It is hard to imagine that the Estonian scholar would not have recognized this short text on Barṣawmā in CFMM 256 — and it is certain that he saw this manuscript; see this previous post — for being what it is, but the name he cites and the one used in the manuscript are strikingly close. I do not otherwise know the text discussed here, but it may be an extract from a larger work; I welcome any further information on it which the incipit given here may bring to mind to readers. Finally, some relevant sociolinguistic discussion on names and naming will be found in chapter 2 (particularly the earlier parts) of Keith Allan and Kate Burridge’s excellent Euphemism & Dysphemism: Language Used as Shield and Weapon (New York, 1991), the rest of which is in many places good for an erudite laugh. Incidentally, from Gero’s note (cited later in this post) the following should be added to the bibliography given in the post on cursing upside down: G. Khoury-Sarkis in L’Orient syrien 12 (1967): 454 n. 89, as well as Harb’s note referred to later in this post. Ed. Lamy and Abbeloos. Gero only cites it as col. 71, line 22; it should be noted that this is in part II of the Chronicon, which is separately paginated from part I. The editors give the regular form of the name from two witnesses in the apparatus. Sokoloff, p. 1279, follows the root meaning and noun pattern and thus simply gives “inclining, bending”. See “Lettre de Philoxène de Mabbūg au Phylarque Abū Ya‘fūr de Hīrtā de Bētna‘mān (selon le manuscrit № 115 du fond patriarcal de Šarfet),” Melto 3 (1967): 183-222. The word in question occurs at 220, l. 16. I am told that a new edition of the letter is forthcoming. For the earlier partial edition, see Alphonse Mingana, “The Early Spread of Christianity in Central Asia and the Far East,” Bulletin of the John Rylands Library 9 (1925): 297-371. “Important Manuscript Discoveries in the Syrian Orient,” Symposium Syriacum 1976, OCA 206 (Rome, 1978), 16.